Pandora-like charms made specifically with the quilter in mind. Watchus has made these adorable charms so easy to use that you can quickly make your own custom bracelet, necklace, earrings or pin. Or for even more fun, you can have a “bracelet making party” with your quilting friends this Christmas! Don’t wear bracelets? Watchus also has these charming earrings, necklaces & scissor fobs. Here is their full collection of quilting charms. Oh I would love this in my stocking! thanks for the chance to win! Those are sew cute. I would love to have this to show the world I am a quilter. Great idea for stocking stuffers! Thank you. Oh, what a sweet goft from Santa to show off at the next Quilt Guild meeting! My best quilting buddy LOVES jewelry so I would love to win this for her! It would be great if Santa wanted to deliver this to me then I could show the world I love quilting. Santa knows I’ve been really good this year and would love to show how muchI Like to quilt by wearing either of these. Oh this is so cute! Even on the days I can’t fit any quilting it, I could have a bit of quilting around me anyway 🙂 I just love the tape measure. Just darling and I have the perfect recipient for this…. me! I am a long time quilter and love to share quilting with others encouraging them to try it. This jewelry would be such a great conversation starter and hopefully help recruit new quilters! Love it! Very cute! Thanks for chance. Such a great idea. Even if we don’t have time to sew we will still be able to take a little reminder with us. No-one could doubt how much I love patchwork and quilting if I was wearing one of those! Thanks for the chance to win. I would love to win this! I picked up some charms on a recent trip and didn’t know how I would wear them! because i would love to own these they are so pretty,please santa. would be so fun to wear!! Santa is going to leave me a charm necklace because I have been a very good quilter this year. I have share my quilts with loved ones for Christmas and Santa would just love to make me happy by stuffing my stocking with a cute charm necklace. This is really fun and such a clever idea this year. Thank you for giving all of your followers such a chance to win such wonderful stocking stuffers. I would so love to win this to show the world that I am not really posessed, it is just a health love ofof a great craft, quilting. Thanks for a chance. Have always wanted a charm bracelet. 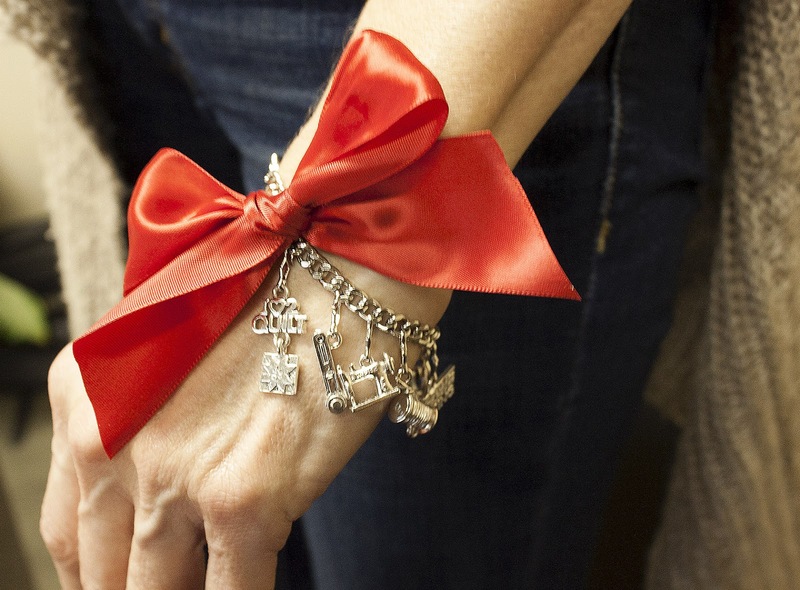 Santa would make me very happy if he left this charm bracelet in my stocking! Thanks for the giveaway. I would love to win this because I love quilting and have never had a charm bracelet.It is a little girls dream to own one. This Christmas is looking very bleak for us as a family and this would lend a little sparkle to the holiday. Thanks for the chance. Very cute. If Santa found me this year, I hope he shops for the charms for me. Dear Santa, the charms are so cute! I would be very excited and pleased should you pick me. Dear MODA Santa…It’s me AGAIN, yes, I was here yesterday, and will be here EVERY day for the MODA Twelve Days of Christmas. You might remember me from long years ago. I was the girl who asked for a Sewing Machine for Christmas back in 1964. I hope I remembered to send you a Thank-You card. I sewed on that TwoTon Kenmore for over thirty years, and it is now retired and enjoying a special place in my Quilting Bedroom/Collection. As you were coming down the chimney with TwoTonTillie that year, I bet you were thinking…”Sure wished Sue had asked for a FEATHERWeight”. LOL, Santa! Anyway, I’d LOVE to have the Sewing Charm Collection in my stocking this year. Just think what a lighter load it would be…unless you’d like to bring me another Sewing Machine. A Featherweight would be great! I’d like Santa to leave me a job for my husband in my stocking, and a job for all the other Hostess workers who were thrown out of week right before Thanksgiving, and anyone else looking for employment. P.S. Sounds like I need a bigger stocking. OH I have been looking for charms like these! I would love to win them! Ohhh Santa I really would like the bracelet!! These are just too cute!! Ohhhhhhhhhh Santa; I love these charms!!!! I will be sooooooooo very good if you could just see your way to put this in my stocking……..
Santa, I have been a very good girl this year and would love to find the necklace or bracelet in my stocking. What beautiful charms. I would love to wear them to show every one . how much I enjoy quilting. I would love to win this so I could share my love of quilting and sewing with everyone – maybe spark someone’s interest in learning! Thanks for the chance to win! My jewelery is eclectic and often a source of conversation at the office -these would open up the quilting side of those conversations. And they are silver – my favorite!!! Santa, I don’t wear much jewelry but those necklaces would let the world know I am a quilter! I hope I am not too late. I would love to win this! Dear Santa, You could leave me a charm necklace that I could wear while shopping for fabric. Maybe it would help explain why I have a a 10′ stack of fabric, books, patterns and notions at the checkout counter. I’m a quilter! What girl doesn’t love jewelry? This are so cute! Would love to wear and show off my love of quilting/sewing! I would so love one of these! It would be fun to wear! I would like one of these prizes as they best represent the passion I have for quilting. Dear Santa, I just started Physical Therapy for my neck.. I think that necklace would certainly be a different kind of therapy for my neck! Mmm hummm! A fun giveaway, I would love to hear these jangling from my wrist! I hope Santa hears me! What fun! I love that they’ve incorporated a lot of crafts, since I also knit and crochet. These are so fun! Santa has been busy – I would love one of these quilty pieces. Adorable charms and I would love to share them with my quilting friends. I’d love to have either prize – having a piece of jewelry that reflects one of my grand passions would be great! What a fun gift! 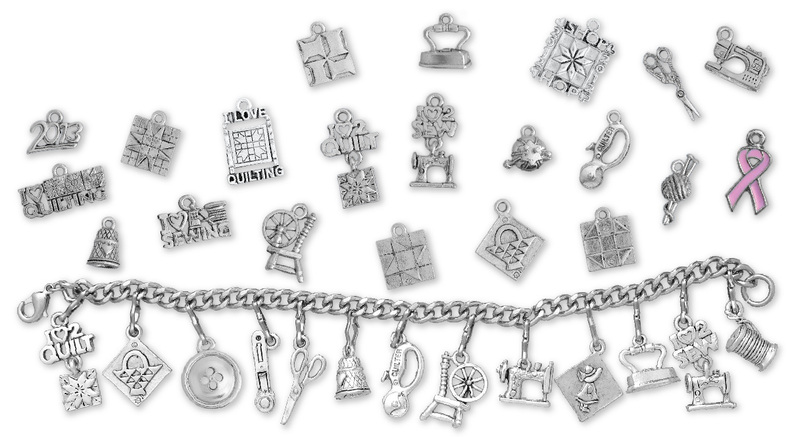 I love charm bracelets – each charm has a story, especially if they are sewing or quilting charms! I’ve been sewing for years, since my grandma and mom taught me and I’ve been teaching my granddaughters to quilt too! I haven’t owned a charm bracelet in 20 years…what a beautiful one. Thanks for giving us the chance to win. If Santa would be so kind as to bring me these charms I would make it know HE was a “Charming Lad”. Thanks for a chance to win. Love ’em! Great looking charms. I have my mother’s charm bracelet from the 40’s and have started my own. 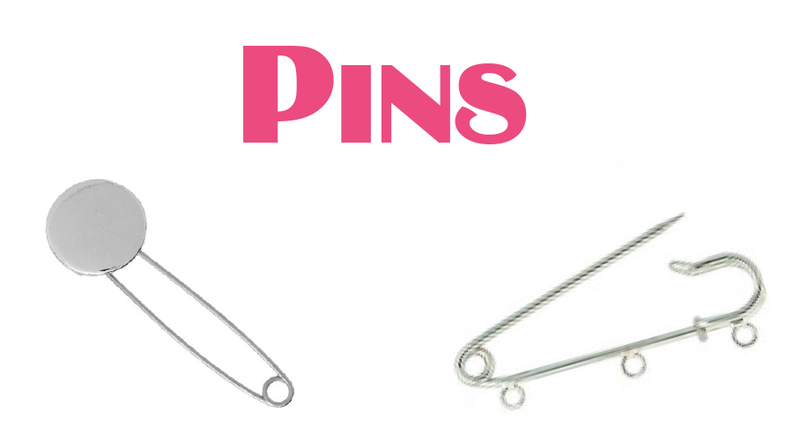 I would love for Santa to leave this in my stocking because I don’t have any sewing/quilting themed jewelry at all! And this is gorgeous! Please put this in my stocking Santa! It’s adorable, I love the charms. Those are so cute! I rarely wear jewelry but those would be the talk of the quilt group! So sew cute! I’d love a chance to win I love distinctive jewellery. These are super cool and I`d love to santo to put them in my stoking. These are so great. When I first saw them a few months ago when it was first posted on your blog I fell in love with them and sent the link to my husband. I think Santa should be nice to me and send them to me because wearing these each day will make me jingle on my wrist and remind me that I should be sewing and not surfing all the quilting/sewing blogs to see what I COULD make instead of doing it. I would love to win this! I’ve been looking for a charm bracelet and this would be perfect!! Because I need a bit of glam in my life. As moms we sometimes forget to take care of ourselves and a little bit of jewelry goes a long way to glam it up! Would love to have santa leave them in my stocking! I havn’t been able to find any at the quilt shops i go to. I need this to show off to my friends – they know I love charms! They are fabulous! thank you! Oh my goodness! I love these charms! I wear bracelets all the time, so I think Santa should put these in my stocking because they would definitely be used and loved! Thanks for the giveaway. Thank you for the chance to win. Very nice. Because they are adorable! Who wouldn’t want them? Thanks for another great giveaway. Love these! I have started making pouches and these would make lovely zipper pulls. I love charm bracelets, and I need a quilty bracelet! Would love to have it! I would love this. A symbol of my passion to show everyone. Thanks for the opportunity to wil. Because they are SO cute!! Oh, these would just be the most adorable present to find in my stocking! What cute charms. Would love to win. I would love to win this, I love charm bracelets and necklaces! I still have my charm braclet from high school in 1966! Would love this to use as tool to introduce quilting to everyone I meet! Great idea! A quilting charm bracelet or necklace would be a wonderful conversation starter to enable me to share my love of quilting with others and maybe get a few new quilters started. I would love to show my love of quilting, these would be perfect. What a great way to show my love of sewing. Thanks for the giveaway. Oh my, these are so adorable! I would LOVE to wear either of these beauties – thanks so much for the chance. I love charm bracelets so this would be great to have! I can show off my love of quilting. These charms are adorable. Santa, I’d love to decorate (myself?) with the necklace or bracelet. I would love to have these in my stocking this year. Especially the Sunbonnet charm. Whenever I see a Sunbonnet Sue, I think of my grandmother who made this pattern as a baby quilt for my mother. I still have it and the quilt is lovely still. What a great way to share my passion!! I would wear either one of these!! Usually I don’t care much about jewelry, but I would love to wear this. I would love to have one of these to show off my love of sewing. Thanks for the chance to win! I so love charms! And I am so glad you shared THESE charms with us because they are wonderful! 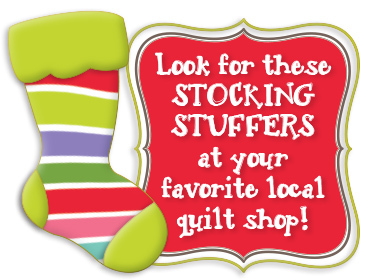 I would love to see these in my stocking – such a fun way to show my love of quilting. Thanks for the chance to win! I’m a happy follower and I would love to find either of these in my stocking! These are perfect! I know so many people who’d love them – including me. I have a gold charm braclet from all the places my DH traveled to for his work. It would be wonderful now to have a quilt related one. What fun! I’ve never had a charm bracelet and have always wanted one! Oh my I haven’t worn a charm braclet for years. They are so adorable. Quilting charms would be out of this world. Every girl loves jewelry for Christmas and quilt themed jewelry would be fabulous. since I love all things quilty…it’s a got to have! Thanks for the chance to win one! These charms are beautiful! I have wanted a charm bracelet FOREVER! This will be a must on my list! Oh my goodness….those charms are SEW adorable! I’d love to show off my love of quilting by having a charm-filled bracelet to wear…hint, hint, hint…. Thanks SEW MUCH for this chance to win!!! I would love to win this as I have almost no jewerly. A break-in last Dec. where they took my jewerly. Very cute! My friend recently lost all her furniture during the flooding from Sandy. If I got one of these in my stocking, I would give it to her. She loves charms and needs something to cheer her up as she rebuilds her life. I’d love to show everyone what my true passion is, quilting. 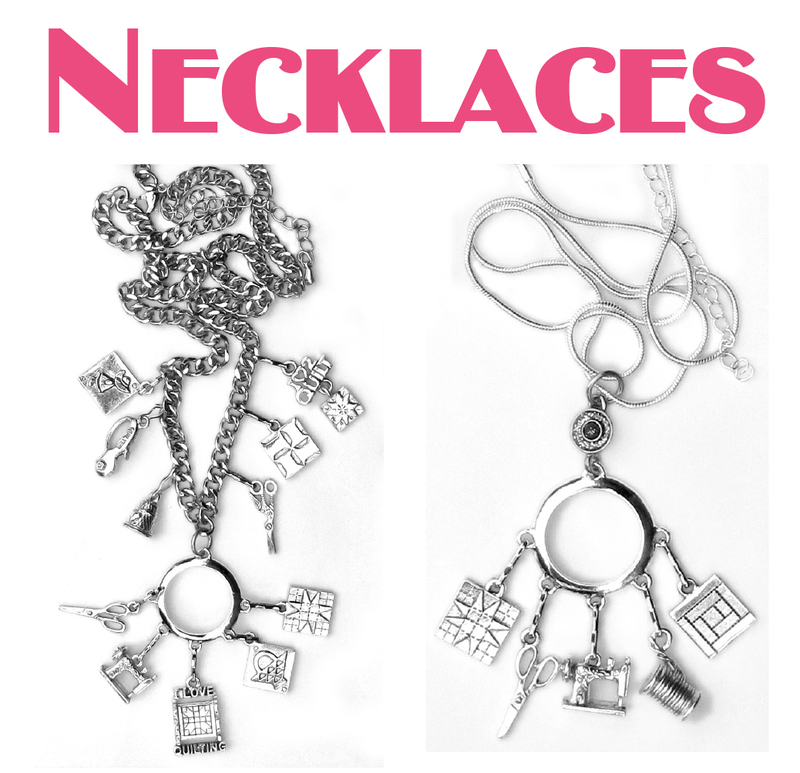 What a great way to do it with a charm necklace. I love these. Why should Santa give me this?? Because it is so darn cute? I love charms. I have a bracelet full of charms that my grandmother gave me. This would complement it beautifully. I love these! I think it would be great to start off a tradition with adding a charm for every quilt quilted to give off as an heirloom. Really!!! I HAVE Been good,Santa!! I would be sew excited to have one of these charm collections in my stocking. It would be awesome to be able to declare my quilting obsession in such a charming and stylish way! I would love to receive this in my stocking because, although it would be difficult to give up, it would make the perfect gift for my best quilting friend, my stepmom. I would love to win one of these – the charms are all darling. Please Santa? What a wonderful way to show our love of this art. I would love to find one in my stocking. Thank you for the opportunity to win one. I would love love love a charm necklace. how cute!!!! I would love to add this to my collection of charms! Very Fun gift! Thanks for the giveaway! These are more grown up than my “Pooh” charms. They would be a welcome addition to my charm love! I love charms! And what a perfect gift for my quilting buddies! These are so cute! How do we find out WHO won each or your prizes? This would be a awesome gift! I’d love to find the earrings in my stocking. So very cute! Super charms for my daughter who makes jewellery. Now that’s bling I’d live to see in my stocking! I’ve always wanted a charm bracelet and these are the perfect charms for quilters and crafters. So cute!! Would love to find some of these cute charms in my stocking. I love charms and these are just so adorable. Love this idea! I am proud to be a quilter and this would be an excellent way to tell the world of my passion. how charming! thanx for the chance to win the charm necklace! such a nice idea; the charms are so cute. This is a wonderful idea and thanks for the chance to win these wonderful gifts. Merry Christmas to all. I a hoping for a digital camera for Christmas! Because this is sew sew cute, I would love to have it in my stocking!!! If I won these beautiful charms, I would give the pink ribbon to my sister who just finished radiation treatments. The other charms would be given to our close quilting friends who have been very supportive during this time of stress. We love them all! What a gorgeous charm bracelet. I don’t know which is my favourite charm. I’d love to win that (or the necklace!). Thanks for the chance. Oh my. I’ve been looking at charms online and in stores lately and those are just about PERFECT!!! Thank you for the giveaway and the chance to win! SO VERY NICE! I’D LOVE TO FIND ONE OF THESE IN MY STOCKING! Id love to find either (or both, ggg) of these in my stocking 🙂 Thank You and Happy Holidays!!! Just relocated to a new state due to hubby’s job. We won’t be celebrating Christmas this year as the kids are too far away to be able to come here easily. I am hoping Santa sneaks in and brings me something quilting related. These charms would be awesome! These are awesome! I’ve never had a charm bracelet so it would be great for Santa to bring me this! I’m not getting anything for Christmas this year, so that would be amazing. Because they do show off my love of quilting! pick me, pick me!!!!! I love it!!!! I would love to win. I think that would be better than a diamond bracelet! These are great stocking stuffers! Just for Secret Santa to give! And Ms. Secret Santa would love to find either in her stocking this year….she’s been extra good! I’ve been a really good girl this year. REALLY!! 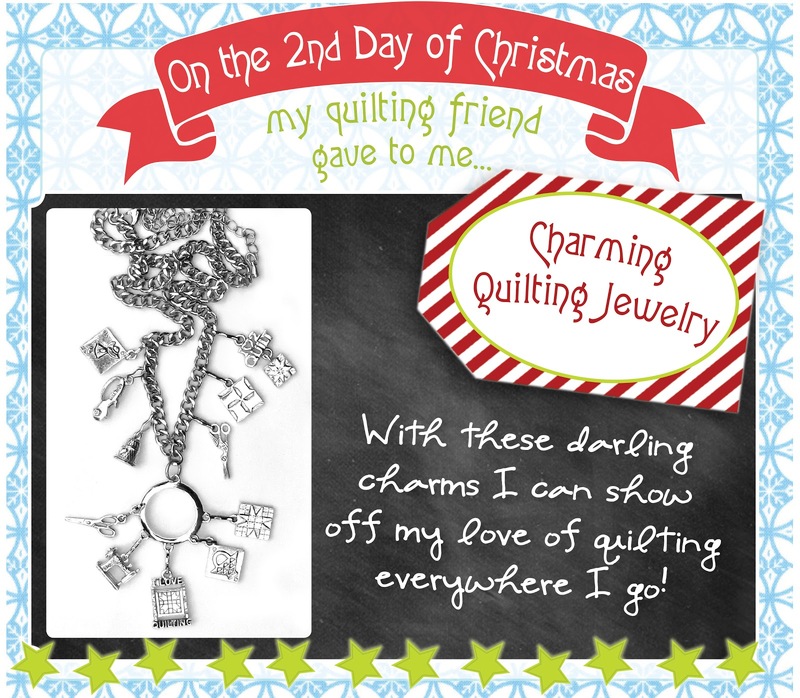 Oh, Santa, I want some quilting jewelry!!!! I would like Santa to leave me a charm bracelet with quilting charms because it will be a great memory of the charm bracelet I had when I was a teenager. These quilting charms would certainly let strangers know how much I LOVE quilting…it becomes a wonderful conversation starter and I will be a walking ad for your charms. I am the one who always stuffs the stockings. If I don’t put anything in mine then I don’t get anything so this would be awesome to put in my stocking. I would like to win because I’ve only been quilting about a year and really enjoy it. I just love the little sewing machine charm! I would love to find one of these in my Santa sack. thank you. Wow what a great prize . First time I’ve seen these charms and like everyone else would love to win. Where can we buy them please? what a fantastic way to combine my two favourite this – patchwork and jewellry. Please Santa…..
Oh I would love to have one of those… they are awesome. I have seen these online before. Thank you for the chance to win. What wonderful charms! Love all the various options that they can be used. A fun way to show off your love for quilting! Thanks for the chance to win. Love these, and my stocking is sew empty! OO MY GOODNESSSSSS! Santa I HAVE BEEN A GOOD GIRL!!!! 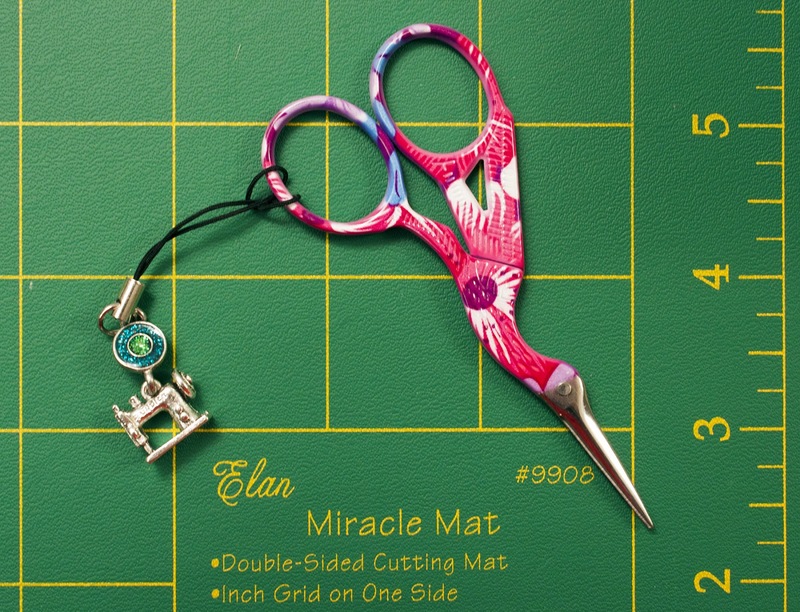 I would LOVE for Santa to leave these for me…I have a dear friend who needs them for her scissors. What a fun way to mark your tools. These are so cute. Especially like the idea of scissors fobs. I enjoy sewing retreats with friends and we all seem to have the exact same stuff. Great idea to keep up with my own tools. There is not much materially I want in a stocking. Would like to have my daughter closer. An organizing genie would be nice but I don’t think Santa brings those! What an adorable bracelet! Wish Santa would leave one in MY stocking!! Only problem? None of the shops within 100 miles of my house carry them. BOO HOO!! Such a charming gift to fill my quilted stocking which I’ve just hung by the chimney with care…. Wow! Beautiful! Now who wouldn’t want a little more bling, and to show the world your second love at the same time! I would love to have this to show the world I am a quilter. Such a wonderful little stocking stuffer. Thanks for the chance. I adore charms & make jewelry for myself, family & friends. I already own 5 of these charms & would love more! I would love to have this in my stocking! Charms are so cute. Thanks for the chance to win. I would love win one of these because I love a jangly cute charm bracelet, and I love quilting!!!! I’ve never had a charm bracelet, let alone 1 containing all of my favorite sewing things. Thanks Moda Santa! Dear Santa….I’m a pretty charming quilter and need these to show it! This is cool. I would love for Santa to leave this in my stocking because as being a mom of 4, my stocking as well as my husband’s are empty each year now. We do for the kids, and nothing for us. OMG I love these!! These are on my wish list. I would like Santa to leave the charms in my stocking so that I would be almost as pretty as Mrs. Claus! Fabulous! I sew wish my LQS would stock these. There are sew many cute charms to choose from. Thanks for a chance to win! I’ve been building my charm braclet for 50 years! I’d love to add some quilt charms! I love these charms. I would love to add one to my bracelet. Thanks for the chance to win! These are fab. would so love to win!1 Thanks for the chance. These are gorgeous! I would love to have quilting charms…just because! Adorable! It would be so fun to wear when out with quilty friends. 🙂 Thank you for the chance! I haven’t seen these great charms before, in any of the quilt shops in my area. 🙁 I just LOVE the bracelet!! That’s why I want to win it!! Thanks for the opportunity to win…I hope I win! Sure would love to have some of these, Santa! would love to win one of these. How fun. These charms are adorable, what quilter would not want a set in their stocking … my stocking has lots of room. Really would love to win, awesome idea! These would make great earrings!! These are so cute. I would love to have it to wear to work…I work in a quilt shop! This would truly be a great gift in my stocking. I love the all the charms. I need Santa to leave one of these in my stocking because I love jewelry, especially quilty jewelry. I would love to have this as a gift for my mother-in-law! She is the sweetest and best MIL anyone could ask for. She is the one who got me started in quilting two years ago, and she helps me often, with a smile on her face, even when I ask dumb questions! 😉 She loves quilting and deserves this special gift. She just lost her mother to cancer, and this would really make her smile! What a wonderful way to acknowledge a part of my life many of my friends don’t see me engage in. Beautiful Jewelry! I will have to hint to my boyfriend that these would be great stocking stuffers!!! 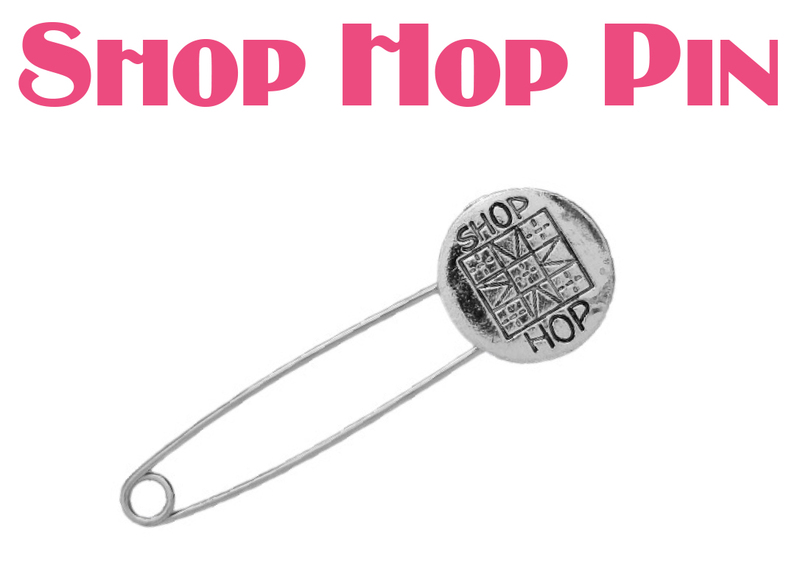 Oh I love jewelry – especially fun pins/brooches. I need these charms-ALL of them-in my stocking so that I can SHOW the world that I am a quilter and PROUD OF IT!!! Love jewelry; love sewing. Great way to combine both together. Nonna Claus would LOVE the charm bracelet! It would be a daily reminder of all the quilts have made for baby gifts! Love making baby quilts! Dear Santa, I would love to have either the Quilting Charm Necklace or Bracelet in my stocking. I am always a good girl but it seems like my stocking is overlooked every year. I’m debating whether to even put mine up with the rest of the family as it’s a little disappointing when it’s empty on Christmas morning. But I guess the bright side of it is that it never has coal in it. This would make a perfect gift for my daughter who has just started quilting and loves it! Pick me! Would love to have one of these in my stocking!! I love quilt related jewelry. Either one of these would be wonderful! These are just too cute. I think I would put them on the zippers of little pouches I make. What a charming gift! They would certainly make my life more charming! I would love to win either piece to show the world that I am a QUILTER and proud of it! Thanks for a chance to win. Charm bracelets are a huge weakness for me. My stocking is always empty for Christmas and I’ve always been a good girl! Not sure why…..
Oh the charms are SO sweet! And wouldn’t it be nice for me to wear beautiful quilt jewelry to accessorize the thread bits that are always sticking to my clothes! Wow! I want these charms in my stocking! I would wear them on my ears, on my wrist, around my neck, and anywhere else I could wear them! I would love to win one of these giveaways. I enjoy jewelry that that is distinctive and different from what everyone else normally does. Thank you for the chance to win such beautiful items. When I am not sewing, I love to make jewelry. These charms would be perfect for gifts for my quilting friends. je tente ma chance, merci !!! I’ve been really good Santa, really. I’d love to have a great necklace or bracelet to wear to guild meetings. I work in a quilt shop, so what better place to wear these lovely charms! What a charming gift for quilters! I would love to have these to wear and share. I’d love to wear these. Thanks for the chance to win. Beautiful! What better way to advertise your love of all things MODA!! Santa knows I’m a good girl who’s been having a hard time of it lately, and what better to cheer up a girl than jewels? I love charm bracelets ! I so love cute things. I am crazy about cute quilts things. Thanks Santa. I love charms and quilting ones would be the best! Oh, that golden scissor gift set, Day 5, love it, love it, love it! Little scissors have been following me home lately, & would love for this one to do that also! The more, the merrier, right! Love the whole darling set, Santa please send it to me, I will treasure it forever, & put it to good use, of course! Thanks!